#catlady and #meow are common hashtags on your Instagram account. your package in the mail includes a card to Amelie & Boone from Milo & Otis (ahem... Lauren! ), and you exchange countless e-mails with a fellow animal lover. you have a cat pumpkin in your house for Halloween. blog friends inquire about your cats' names. 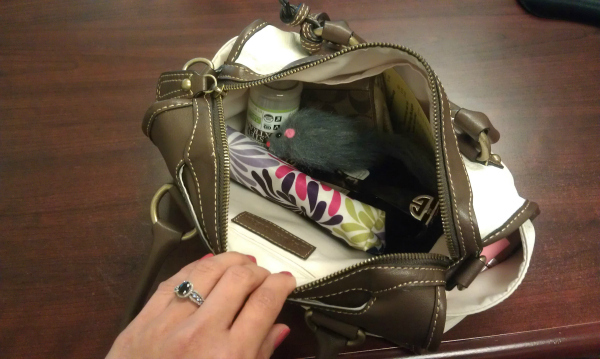 you find a toy mouse in your purse when you're at work. It's official. Guilty as charged. I love your cat pumpkin. My cats refuse to play with cat toys instead they like shoelaces, milk lids and hair bobbles. I will forever love my cat lady sista! Love it; you could probably freak some people out with that mouse at least I could at work anyway! Gotta love those kitty babies! You're also a cat lady if... Most if the pics on your iPhone are of your cat. Yup. That's me!! hahaha love this post and love that you're a catlady! oh my goodness this really made me laugh!! HAHAHAHA someone wanted to give you a little friend to take around with you! That's adorable. :) Being a cat lady is so much fun! HAHAHA the cat toy!!! So funny. Noel has the same one and loves it! I'm finally sitting down- ON A CHAIR!- and reading this. So, so cute!! The mouse in your purse is hilarious! I find tennis balls and poo bags in my pockets/bags all the time, but I don't think I've ever found a cat-related item, so clearly Mia's dropping the ball/mouse there! Basil leaves me treats in my purse all the time. Except his toys have been killed multiple times and look pretty gross. Sometimes he keeps them and puts them in his food dish. I guess that's why he's a fat cat. There's nothing wrong with being a cat lady! If I could have cats in my dorm I would be one too!